Things are getting worse in Burundi, and the world is paying less attention. 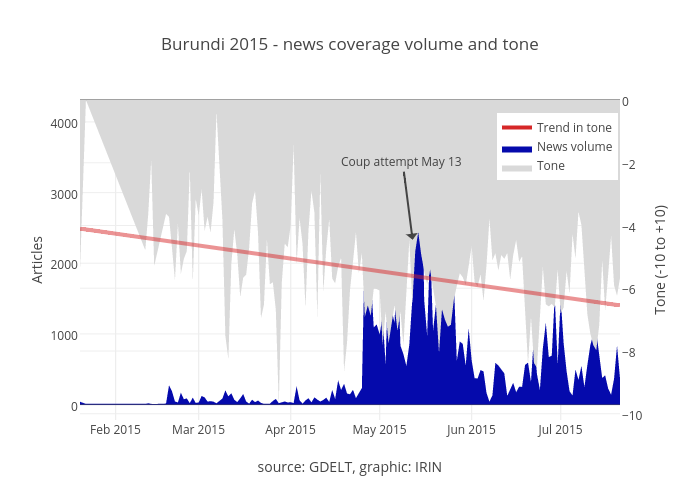 As Burundi holds controversial presidential elections today, IRIN reviewed the news coverage gathered by the GDELT database since January. The volume of recorded news coverage peaked around the coup attempt in May and has dropped since. A news article's "tone" may be ranked between -10 and +10, with +10 being highly positive. While the volume of coverage is lower now, the trend in tone, as analysed by GDELT's automatic sentiment analysis tools, continues downwards. For more Burundi news and analysis, click here.